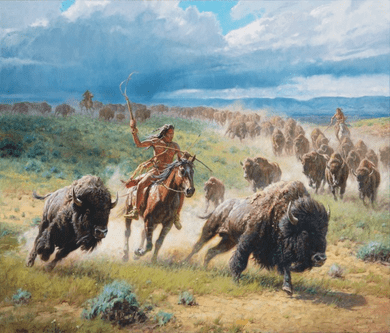 Martin Grelle Hand Signed and Numbered Limited Canvas Giclee:"Chasing Thunder"
Size: 30" x 36" and 40" x 48"
Edition / Medium : Artist Hand Signed Limited Edition Canvas Giclee to 225 with 15 Artist Proofs and 15 Grande Editions. COA Included. About the Art: Whether painting the Native Americans in a dramatic, picturesque setting, or the American cowboy in the dusty cattle-working pens, Martin Grelle captures the spirit, beauty, and vastness of the West in his historically-accurate, compelling images. Grelle studies diligently to portray the diverse cultures of the American West accurately and with sensitivity. His knowledge of the cowboy's way of life, gained from his time spent horseback on ranches during the annual Cowboy Artists of America's (CAA) trail ride, as well as the time spent with local ranchers and friends, is evident in his contemporary cowboy paintings. The many hours spent in museums, at historical re-enactments, in visiting with experts on Native American culture, and reading from his extensive library, have helped him to bring his vision of the Plains Indian culture to life on canvas. No thank you, I just want the 30x36 SN Canvas.